I remember this pie from my childhood. This was one of the few pies not relegated to holiday celebrations because it was inexpensive, easy, and quick. While I am a big fan of making things from scratch I have no problem using the pudding mix, whipped topping, or store bought pie crust. If you would like you could make homemade whipped cream and pistachio pudding. Make sure the pudding is cool before assembling the pie. A creamy no bake pie. Make pudding according to the pie filling directions. Slice bananas and place in bottom of pie crust. Pour pudding over bananas. Cover and refrigerate for at least an hour. 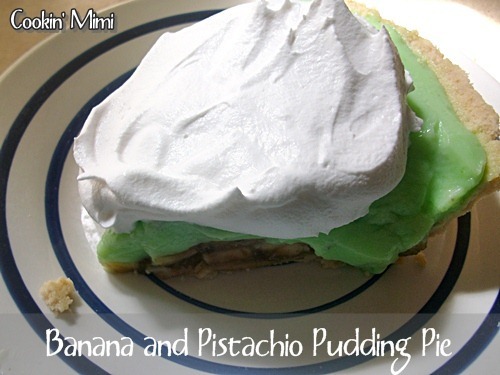 Top slices with whipped topping when serving. Note: if you wish to keep the bananas from browning brush them with a little lemon juice.